The move is part of its broad cross-platform browser support, an element of its plan to develop the cloud services that revolve around Office 365. In an Office 365 blogpost Amanda Lefebvre, Technical Product Marketing Manager for Office Web Apps, says that Microsoft plans to enable Android tablet users to access Office content and tools through a Chrome browser. She does not give a date for the development, but attributes the move to Office Web Apps being a key connection between Office and the expanding array of devices used by customers. Lefebvre also outlines a move from same time to real time co-authoring on Office cloud applications. In other words, when two or more people are working on a document together, they will be able to see edits from the others as they happen without needing to refresh. "This is a subtle change, but a great enhancement to enable even richer collaboration," Lefebvre says. 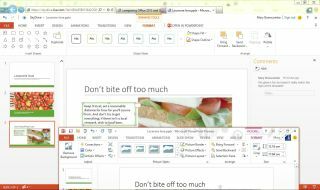 Microsoft launched Office Web Apps in 2010 as companions to Office desktop functions. Lefebvre says that, in addition to the cross-platform support, it is working on the user experience and social and collaboration tools.